Rain likely. Thunder possible. Morning high of 61F with temps falling to near 50. Winds NW at 15 to 25 mph. Chance of rain 80%.. Rain. Becoming windy overnight. Low 38F. Winds N at 20 to 30 mph. Chance of rain 80%. Rainfall near a quarter of an inch. 2018 Farm Leader Dan Schaefer, center, talks with Troy Truitt, left, and John Schaefer, right, at the Farm Leader banquet at the Hilton Garden Inn in Champaign on Monday, March 25, 2019. Maurice Gordon, left, and Susan Kloth at the Farm Leader banquet at the Hilton Garden Inn in Champaign on Monday, March 25, 2019. 2018 Farm Leader Dan Schaefer, left, and Ken Dalenburg at the Farm Leader banquet at the Hilton Garden Inn in Champaign on Monday, March 25, 2019. 2018 Farm Leader Dan Schaefer gets a hug from Donna Rich at the Farm Leader banquet at the Hilton Garden Inn in Champaign on Monday, March 25, 2019. Helen Miller, left, and Janette Porter at the Farm Leader banquet at the Hilton Garden Inn in Champaign on Monday, March 25, 2019. Rick Nelson, 2014 Farm Leader, left, 2018 Farm Leader Dan Schaefer, center and Mike Nelson at the Farm Leader banquet at the Hilton Garden Inn in Champaign on Monday, March 25, 2019. Jim Rossow, News-Gazette Vice President of News, left, Linda Morgan, center, and Dennis Riggs at the Farm Leader banquet at the Hilton Garden Inn in Champaign on Monday, March 25, 2019. 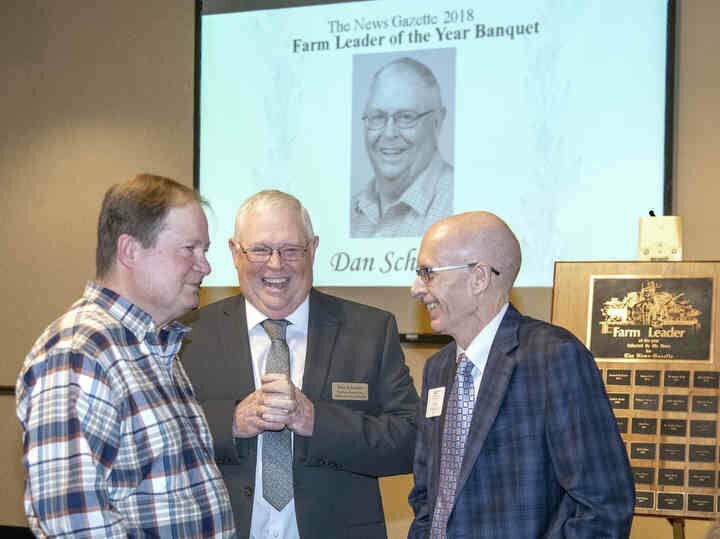 2018 Farm Leader Dan Schaefer laughs with News-Gazette reporter Ben Zigterman at the Farm Leader banquet at the Hilton Garden Inn in Champaign on Monday, March 25, 2019. Lynn Schaefer at the Farm Leader banquet at the Hilton Garden Inn in Champaign on Monday, March 25, 2019. 2018 Farm Leader Dan Schaefer at the Farm Leader banquet at the Hilton Garden Inn in Champaign on Monday, March 25, 2019. The Farm Leader banquet at the Hilton Garden Inn in Champaign on Monday, March 25, 2019. 2018 Farm Leader Dan Schaefer, second from left, talks with well wishers at the Farm Leader banquet at the Hilton Garden Inn in Champaign on Monday, March 25, 2019. L-R-Mark, Abby and Aubrey Schaefer at the Farm Leader banquet at the Hilton Garden Inn in Champaign on Monday, March 25, 2019. News-Gazette reporter Ben Zigterman, left, talks with 1980 Farm Leader Keith Kessler at the Farm Leader banquet at the Hilton Garden Inn in Champaign on Monday, March 25, 2019. 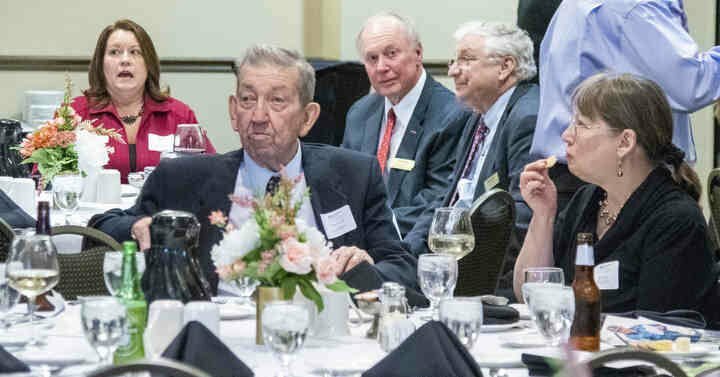 Keith Kesler, left, the 1980 Farm Leader of the Year, talks with Ray Carlson as Lora Mae Kesler listens at the Farm Leader banquet at the Hilton Garden Inn in Champaign on Monday, March 25, 2019. Larry Franks, left, Troy Truitt, center, and Phyllis Truitt, right, at the Farm Leader banquet at the Hilton Garden Inn in Champaign on Monday, March 25, 2019. Donald Wood, 1996 Farm Leader, left, Molly Kelley, center, and Lois Wood, right, at the Farm Leader banquet at the Hilton Garden Inn in Champaign on Monday, March 25, 2019. Steve Moser, left, Kent Krukewitt, 1995 Farm Leader, center, and Lee Eichhorst, 1993 Farm leader, at the Farm Leader banquet at the Hilton Garden Inn in Champaign on Monday, March 25, 2019. Charles Ehler, 1983 Farm Leader, and Nancy Reifsteck at the Farm Leader banquet at the Hilton Garden Inn in Champaign on Monday, March 25, 2019. Shelly and Lynn Schaefer at the Farm Leader banquet at the Hilton Garden Inn in Champaign on Monday, March 25, 2019. L-R- 2018 Farm Leader Dan Schaefer, Emerson Nafziger, Cynthia Nafziger, Howard Brown and Rosanne Brown at the Farm Leader banquet at the Hilton Garden Inn in Champaign on Monday, March 25, 2019.